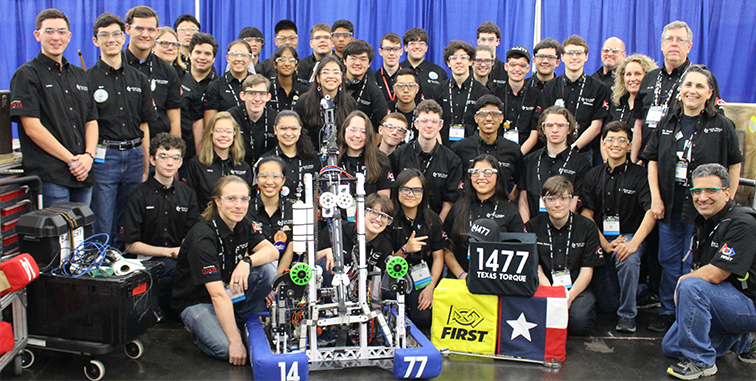 After this year’s busy build season and the continued work on the robot throughout the last 9 weeks, Texas Torque was eager to compete at its first official FIRST Robotics Competition event since last year’s Championship — the Dallas Regional. Following the first day, which consisted primarily of travel and pit setup, the team entered its first day of competition at the Dallas Regional. While key members in each of the build subteams spent nearly the entire day working on final adjustments on the robot, other teams members took time to help out other teams at the regional. As a team that considers Gracious Professionalism one of the driving influences on the team’s character, a solid portion of our team’s members went out into the pits to make sure that all teams would be in tip-top shape for the following day of competition. Work on the robot finished successfully as well; near the end of the day, our team played two practice matches to get a feel for the gameplay and performed very well on the field. On the second day of the competition and the first day of qualifications, Texas Torque started the day off with a bang , winning its first qualification match 165—28. As the day went on, Texas Torque suffered some mechanical and electrical difficulties, causing problems on the field. Still, the team’s members kept their spirits high, fixing problems as they arose with a respectable air of efficiency and calmness. The day ended with a victory playing with FRC 148, the Robowranglers, and a 5-3 record overall. That night, team leadership and scouting/strategy officials on the team met to discuss what could be seen in the following day of competition and potentially strong alliance partners in the next day of competition. The third day of competition started with an unexpected loss due to further problems on the robot. We continued to play through the rest of the qualification matches, ranking 21st. We were happy to form an eliminations alliance with FRC 1817, the Roboraiders, and FRC 3735, the KleinBots. However, our 3rd seeded alliance lost in the quarterfinals due to the 6th seeded alliance after two hard fought matches. 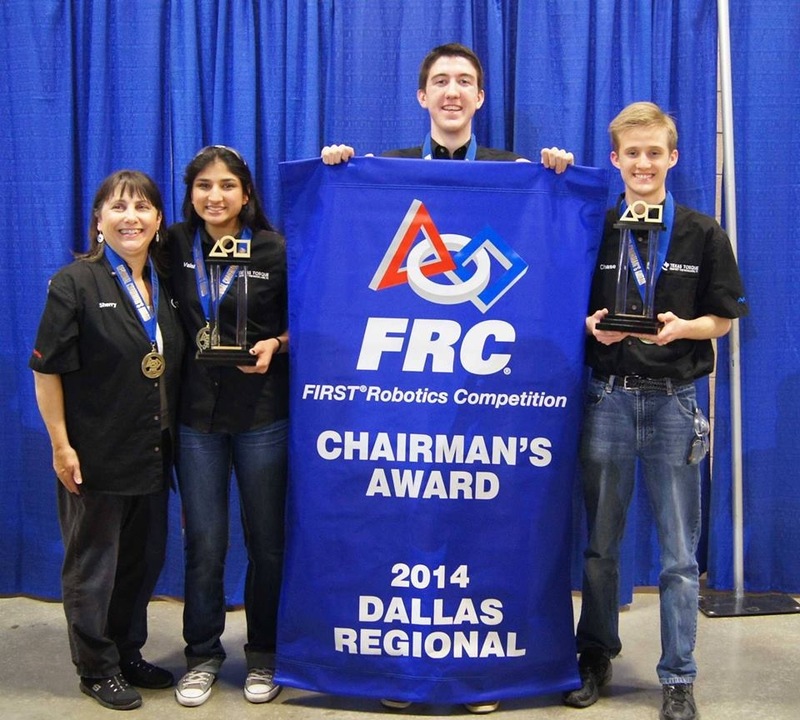 The regional ended fantastically with a well-deserved Chairman’s Award, the first ever in Texas Torque’s history. 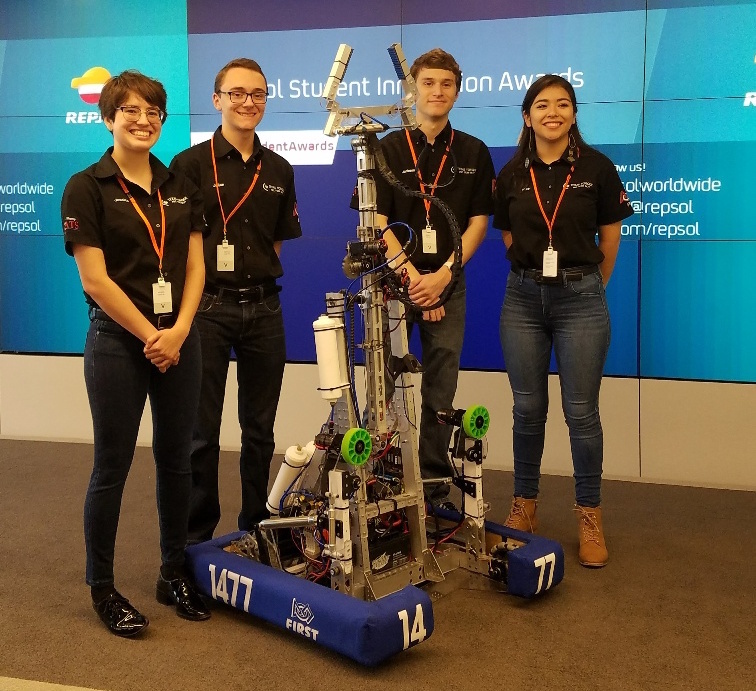 The team is honored to have been bestowed this prestigious award and be identified as a team whose character and impact serves as a model for other FRC teams. The team celebrated this victory with a dinner with FRC 359, The Hawaiian Kids. The presentation squad poses with the newly acquired Chairman’s banner alongside a key mentor, Sherry Coats. Texas Torque would like to congratulate FRC 148, the Robowranglers, FRC 359 The Hawaiian Kids, and FRC 457, The Grease Monkeys, for their unchallenged victory at this event. In addition, we are gracious for the efforts of the Irving Convention Center for hosting the event, as well as the constant support of our sponsors and everyone involved with the team. We hope to see many of these amazing teams at the Lone Star Regional in two weeks; in the meantime, Texas Torque members across the board will be busy preparing for this upcoming challenge.